In the past 150 years a total of 46 yacht clubs, world wide, have competed in a series of elimination races to earn the right for the winner to challenge the holder of the Cup. A Snapshot of BQYC at this Event! Overall, a very successful, once in a lifetime, memorable international regatta. The BQYC Team did proud in representing BQYC and Canada! Best races were 14th (in 35 knot winds where three yachts were dismasted) and 12th. 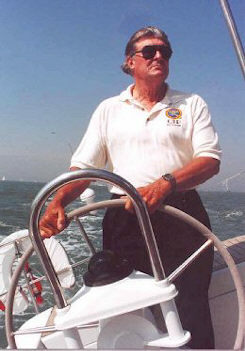 Tactician/Navigator: Mike Creagh (Owners rep who must be on board for insurance purposes). 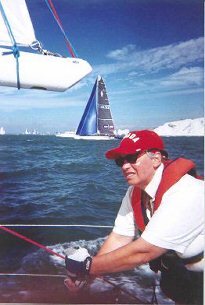 many of the yachts that we beat were crewed by internationally famous yachtsmen; Yeoman of England was one, sailed by Aisher, a previous two time winner of the Admirals Cup, and there were many such others. nobody fell overboard and within about 30 seconds we had everything under control and were racing again. On the final run to the finishing line we were the only boat to have it's spinnaker up! Also we were fouled by the Russian National crew who blatantly disregarded rule 10....port/starboard and then when we had to duck them to stay alive they tacked right on top of us and even though they were windward boat, they refused to give way, We lost minutes in that encounter. We could have placed at least 4 or 5 places higher had that not happened. The 12 metre and modern America's Cup Class canceled because of the weather. Today's result was not as good as yesterdays; we finished just in the second half of the fleet. Rather a disappointment to all, especially as for the first three hours we were up with the leaders group and our position in the fleet was in the top 15 or better. The weather was much more benign today...wind 25 knots, flat water but the tide still running at 4 knots. While we were otherwise occupied the yachts that we had been dueling with all sailed off into the distance. We managed to close the distance quite a lot but not enough to make a difference to the final result. 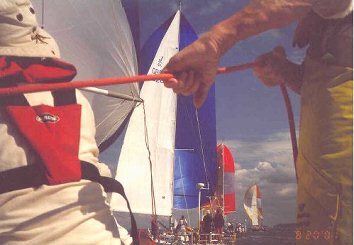 Crowded racing with spinnakers set! 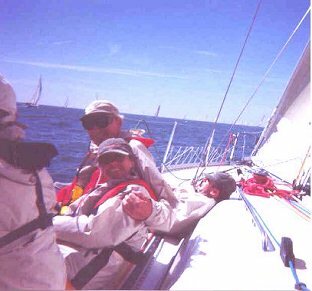 Many of the yacht skippers in our division are taking quite an interest in our campaign and have nothing but praise for our efforts, particularly since we are on a chartered yacht. Quite a few have commented on our crew composition...3 ladies, 4 men over 65, 3 around the 60 mark and the youngest over 40. 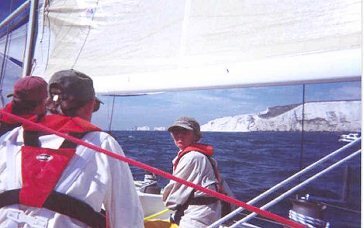 They point out that their crews are generally in the mid twenties and wonder how we are achieving such good results with our crew. 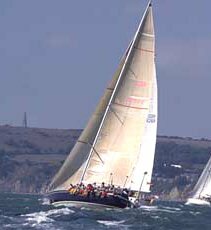 Of particular significance is the fact that one of the top racing yachts in the Solent "Yeoman of England" skippered by David Aisher, a two time Admiral's Cup winner is only just ahead of us in our class. First Race Day. Dump the main and hang on! Everything went very well for the first two hours until the genoa halyard broke. 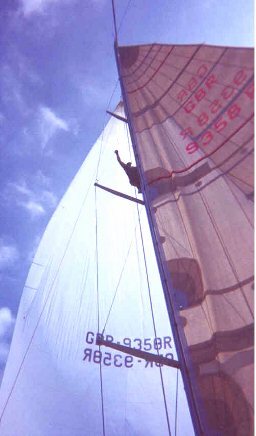 The sail was quickly dropped and connected to a spinnaker halyard and we only had two yachts pass us during the change. Going clockwise around the Island we stayed close inshore until passing St.Catherines lighthouse when we set course for the Needles. At this point the fast yachts started passing us. First was "Stealth" the Italian design which came screaming past only 50 ft away doing what must have been in the region of 15 knots plus. 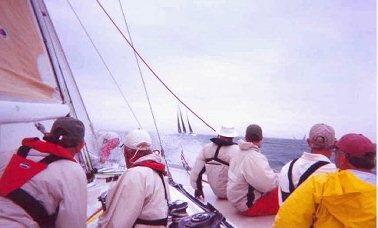 After that we were more slowly overtaken by the old America's Cup class and then the fun really started! British IACC yacht GBR closely pursued by the Italian Luna Rossa from the Prada stable. This is where it got really interesting...GBR passed us with about 200 yards to the mark, Luna Rossa was slightly wider but astern of us. 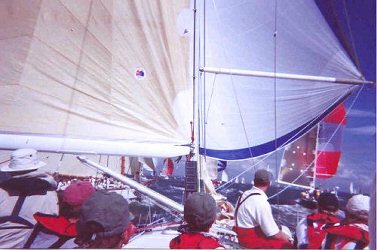 Within two boat lengths we were on starboard with our spinnaker up and no overlap from Luna Rossa and we could, if we chose, have put Luna Rossa wide of the mark allowing the British yacht to increase its lead. Congregated around this jibe mark were at least 500 spectator boats, umpteen press and television boats and no less than five news helicopters filming the mark rounding of the Needles. behind Luna Rossa and in front of all of the cameras and spectators our crew carried out a classically perfect spinnaker jibe around the mark. boat lengths of us and each other throughout all of the races so far. The yachts that went to the mainland shore got better wind and sailed away from those on the Island shore. We finished a disappointing 28th and only touched the bottom once! 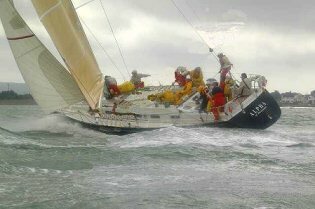 Our overall position in the Around the Island Race was 94th out of about 150. Richard does a repair job! It is unlikely that there will ever be such a regatta again. 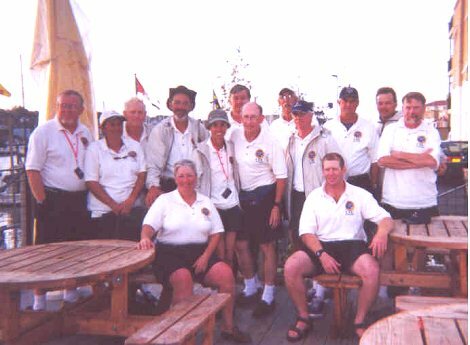 It was an experience of a lifetime and the crew were honoured to represent BQYC, and Canada, at such a great International sailing event!